Since 2012, a group of women has staged regular demonstrations in front of government buildings in Tunis. These are the "Photograph-Women". They are called this because they hold portraits of men in gilt frames in their arms: their sons, brothers, husbands - all of whom have disappeared trying to reach Lampedusa clandestinely at the time of the Arab Spring. Shortly before they arrived on the island, some of them made calls to their nearest and dearest.Since then, no news. But nor have any bodies been found to demonstrate that they are dead. The calls received are interpreted as proof of life by the "Photograph Women".They firmly believe that their loved ones arrived in Italy, were kidnapped by the mafia and locked up in secret prisons. They want the truth.Om El Khir Ouirtani is one of these women. She is the only one who does not wear a veil. She considers herself as an independent woman in a society liable to be radicalised. 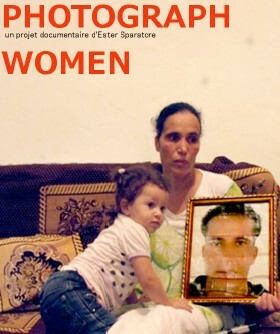 Her husband, Nabil, left without telling her on 29th March 2011, when she was pregnant with their third child. Although devastated, she created, with Imed Soltani, the association called "Everybody's Earth", whose actions have prompted the setting up of a commission of enquiry, led by the government.From balance to imbalance, she is also trying to rebuild her life for her children. Today, her aim is to find a sustainable way of meeting the needs of her family, so that they no longer need to rely on the generosity of those close to them. The film follows her road to emancipation, providing a precious account of the migratory process and the current situation in Tunisia.